...Is it time to try something new? 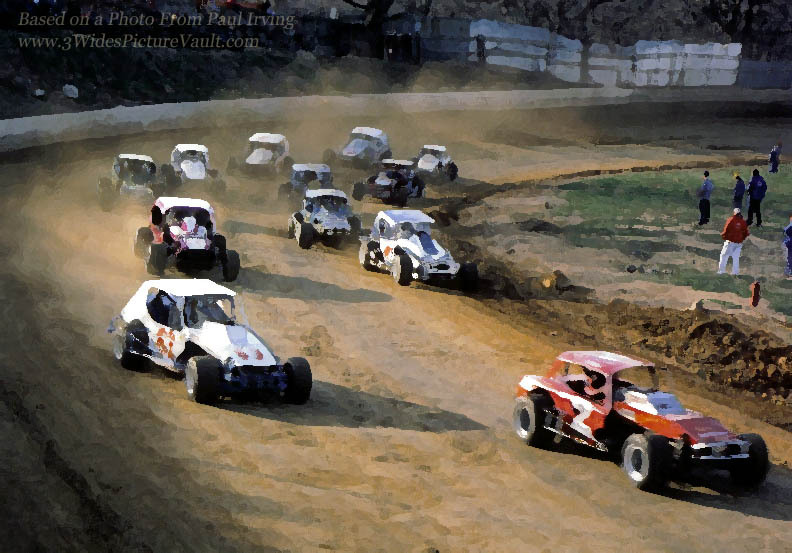 Always an important part of the show, heat races often had the competitive feel of "mini-features," where driver's ran hard, lap after lap, to earn a qualified position. For years, short track facilities followed a heat/consolation/feature format. 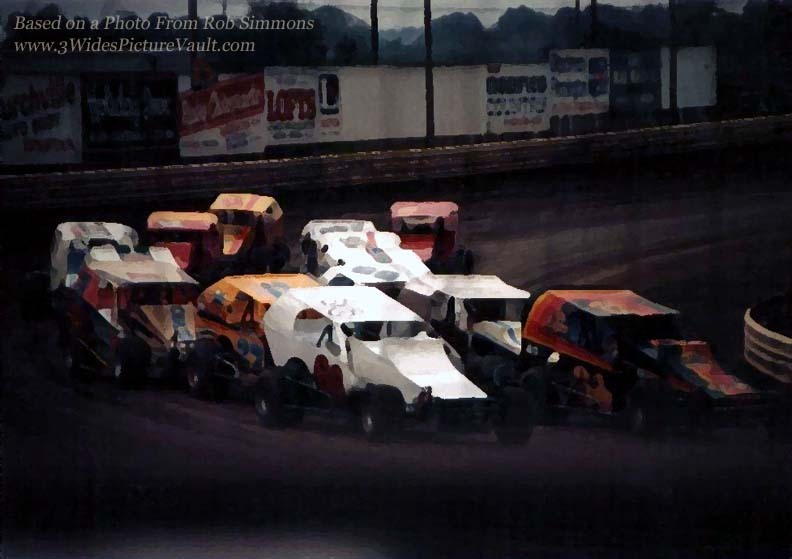 This was born out of necessity as both modified and sportsman divisions had more cars sign in each night than they had starting positions available for each division’s feature event. It has served our sport well. The heat/consolation/feature model worked well because each event had value, because each event had “something of significance on the line.” Every race, every position meant something and because of it, the excitement was maintained throughout the heats and consolation events. Those that qualified for the feature deserved to feel proud. Though disappointed, those that didn't would be back the following week, more determined than ever to make it into "the show." A review of the area tracks for the past 4 weeks (July/Aug 2014) reveals that many are seeing maximum car counts between 8 and 24 for their various divisions, with a range for most of 14 – 22 for their headlining divisions. There are a few exceptions, but I think all agree that lower car counts per division for the "weekly" show is a trend that is likely to continue through the remainder of 2014 and into 2015 for quite a few tracks. For me locally (NJ/Eastern PA), I still believe that a lot of the sport's future is directly in the hands of the few that are involved with managing the show. Local speedways as Bridgeport, Grandview, Mahoning Valley, New Egypt, Middletown and Wall all have something to offer. Some are enjoying the same level of success as they had in year's past, while others are struggling with car count and with lower spectator attendance. Although almost always still listed the "Schedule of Events," consolation events are rarely run. If they are run, they usually have just 1 or more car than are guaranteed to transfer. (Example 25 cars, 8 qualified in the 3 heats, leaving 7 not qualified. If one cannot make the call, then the consolation becomes unnecessary.) How many of us remember the true drama that driver's, crews, and fans all experienced when a field of cars came out for what was billed as "The Last Chance Race"... knowing that some would earn their spot for the feature, and those that didn't would have to watch it from the top of their truck, or from the stands? As a result of tracks with low car counts still insisting on running the heats/consolation qualifying method as part of their weekly show, all events leading up to the feature events have little fan value, sometimes taking on the look of "show filler." For example, some tracks might advertises that their racing begins at 6pm but the first 90 minutes - 2 hours might consist of races that have very little value, and a very low “competition level.” In many cases once the "heats" are over, the track often chooses to go right into their intermission which is often another 30 – 45 minutes of low, or no on track fan value. Then around 8:00 - 9pm (after already being in attendance for almost 2 - 3 hours in some cases) the “actual competitive racing begins,” as the first feature takes the green. Sadly, some fans (especially those with youngsters or with a long ride home) don’t even get to see all of the features because although it may only be 10pm, they have been there for 4+ hours and in some cases "have seen enough." Watching 2 hours of low competitive value events/intermission with the hopes of being rewarded afterward with 2 or 3 high competitive level features is not a sustainable model for today’s race fans, and certainly not a model that is going to attract new fans to the sport. 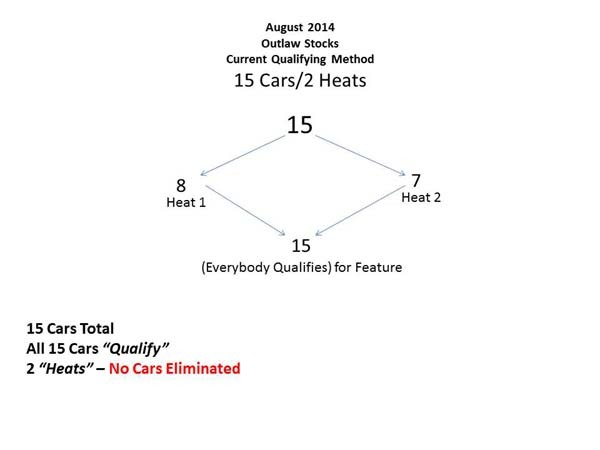 For any division that has less than 25 cars in a division on their weekly program, it is time to abandon the traditional heat, consolation, feature format model, and replace it with a new qualifying format called ”The Top Half Advance” method. 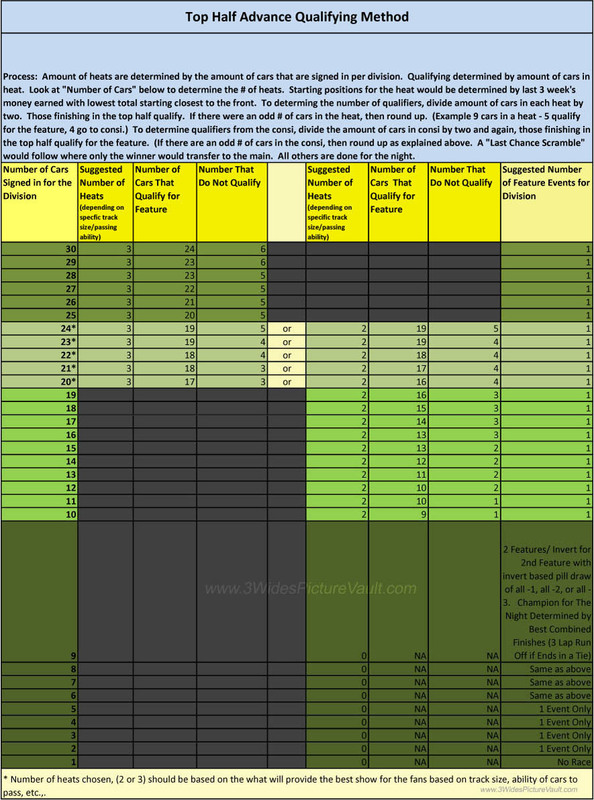 The "Top Half Round Up” qualifying format is a unique way to build value into the entire show by making sure that ALL event have a high level of competition built in, where good performance is rewarded and poor performance results in elimination. With the "Top Half Advanced" format, no one is guaranteed a place in the feature regardless of how many cars sign into a division for that day/night. Many will transfer to “the final” but there will always be some that don’t. It is 100% dependent on their performance. Competition remains core to every event run. The number of heats are determined by the amount of cars that are signed in per division for that show date. Divisions of 10 - 20 cars would have two heats. Divisions with 21 - 30 cars could have three heats. (Divisions with 9 or less cars should run feature events only.) Note: When there are between 18 - 24 cars, the amount of heats (two or three) should be made by track management based on what would provide the best show for the fans based on track size/passing characteristics. Example for a 1/2 - 5/8th mile track): If 20 cars sign in for a division, a larger track might choose to have less heats (two) containing more cars (10 & 10). The amount of heats to be run would have to be announced to all competitors once all cars are signed in for that event for that race day, prior to the beginning of qualifying. Starting positions for the heats would be determined by last 3 week's money earned with lowest $ total starting closest to the front. Those cars failing to qualify through the consolation event are eligible to run a "Last Chance Scramble" event where the winner only would transfer to the feature event. (No championship points would be awarded for the Last Chance Scramble finishing positions.) Because this truly is "their last chance" this race should have a time limit (including yellows) and the amount of laps would be double the amount of cars that made the call. Example (2 cars = 4 laps, 3 = 6 laps, 4 cars = 8 laps, 5 or more cars = max of 10 laps. 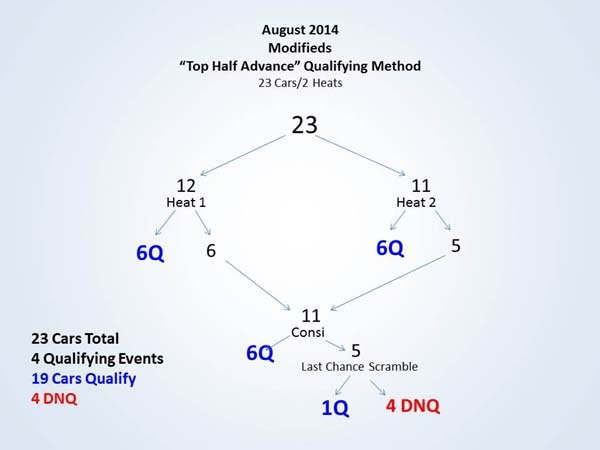 With the "Top Half Advance" qualifying method, all events have something at stake. Driver's either advance or face elimination until finally only the true qualifiers make it to the feature and those that don't will have more to prove the following week! 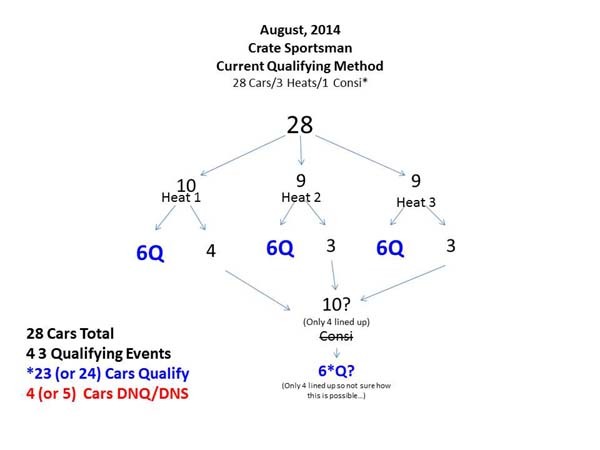 "Top Half Advance" Example #1 Using Real Car Counts From 08.30.14 "Track A"
"Top Half Advance" Example #2 Using Real Car Counts From 08.30.14 "Track B"
o Every race will have “something on the line” which will mean more “buy in” from the fans, more fan value, and a more competitive format for the racers. o All racers will have to compete to earn a spot in the “final” which will result in actual “racing/competing” rather than “just finishing” which will appeal to the competitor in them. o The announcer’s will not have to feign excitement for heat races that have little on the line other than a “redraw spot,” and instead will be able to play off the very real drama, engaging the crowd by explaining what is at stake - how many qualify - as each qualifying heat rolls onto the speedway. Then during the consolation and "Last Chance Scramble," they can remind the fans how many will “make it onto the feature and how many will not. o Drivers that successfully transfer to the feature will have a sense of accomplishment. o Speedway Management will have the option to review the purse structure to either reward the cars that successfully qualify for the feature to help increase competition. o The Top Half Advance format eliminates the “redraw” carrot that is both confusing to fans, and lacks true value in motivating all drivers to run hard every lap/every race. o Some competitors and some fans may be of the opinion that you should always start all cars (up to 24 per division) in the feature. Some feel that if there are 24 cars or less, they should all start the feature because “they are there” and “that’s just how it’s always been.” While I would agree that more cars "should" make for a better feature, we all have to realize that allowing everyone to start the feature is taking the competitive element out of all events leading up to the feature, leaving fans with a very watered down show. This has never been, and should never be a sport where everyone gets a ribbon. That is not what short track racing is about. o Drivers who currently make the feature each week by finishing near the back of the pack in the heat races may feel threatened by the new format. (This surprisingly might be balanced out by those who would be motivated to become involved in the sport because of the additional competitive aspect. All racers are important to the sport, (some of my all time favorites never won a modified feature!) but allowing everyone to start the feature just because they drove a long way, or because they are “good guys” is compromising the whole concept of “exciting, competitive qualifying events, which is destroying the first 1/2 to 2/3rd of today's show. If only 1/2 or less of the show (features) offer true competition, how much longer will spectators be expected to support today’s admission prices, since they are really only getting 1/3 to 1/2 of the show they got 5 years ago? If there are no fans in the spectator stands, how can a race team justify an R.O.I. to an existing or potential sponsor? o Implementing a new qualifying format during the season may not be welcomed by all competitors. To counter this, if implementation is made mid-season, competitors should receive the same amount of money and same amount of points exactly as they would have for a comparable finish in the feature. Example: The last place finisher of the Last Chance Scramble would receive the same purse and same amount of points as if he had finished last in the feature (up to 24 cars if that has been the process year to date.) The 2nd to last place finisher of the Scramble would get the same points/payout as if he finished 2nd to last in the feature. 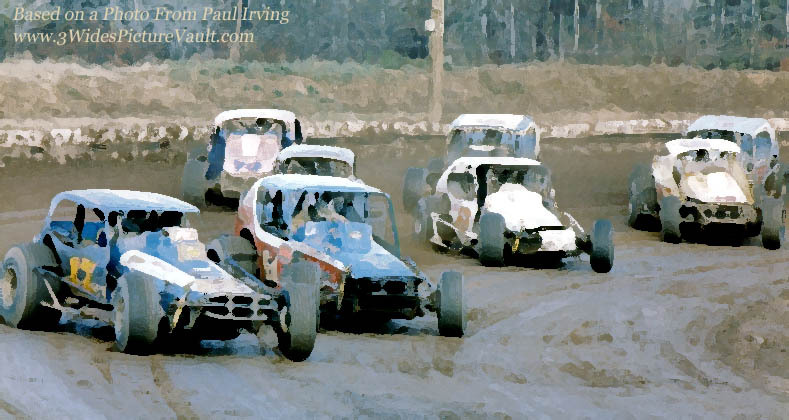 ...Remembering when the thrills witnessed from the competition in the heat races and "consi's" was often as exciting as what would follow in the evening's feature events! Paul Irving image (Nazareth Speedway) used to create image above left & Rob Simmons image (Flemington Speedway) used to create the image above right. I've given the above "qualifying method" quite a bit of thought. I've run it by a few folks who's opinions I value and their initial response has been, "seems interesting." I don't own a racetrack, I don't own a race team. I am not, and have never been employed by a racetrack. I am just a long time fan of the sport who knows that the show being offered by many of the local tracks will not put more fans in the stands, will not put more drivers in the pits.... and most damaging of all, will not grow the sport. What I am "suggesting" here has a few "bumps" that will need to be worked out. It may make total sense to some, and may be scoffed at by others. Maybe the #'s need a little tweaking.... Either way, I'm fine with it, as long as it leads to a discussion, and eventually to a change to a new qualifying model that makes sense based on today's car counts (2014) - not based on the 1990's. Use all of it, or use none of it, but the sport cannot grow (fans and/or competitors) if the same qualifying method continues to grind out... with track management "hoping" that this weekend 30+ cars will show up for each division, even though YTD the show has been averaging closer to 20 (or less.) Doing something just because "That's always how we've done it" doesn't work when what made it work is no longer in place. Expecting folks to pay $15 - $20 for a regular show, where many of the events take on the look of organized practice sessions (even with the "redraw" carrot thrown in) rather than actual "races" will not move the sport forward. Change is needed now. Ownership/management of all short track speedways need to acknowledge beginning this week that car counts of years past are not likely to return soon. 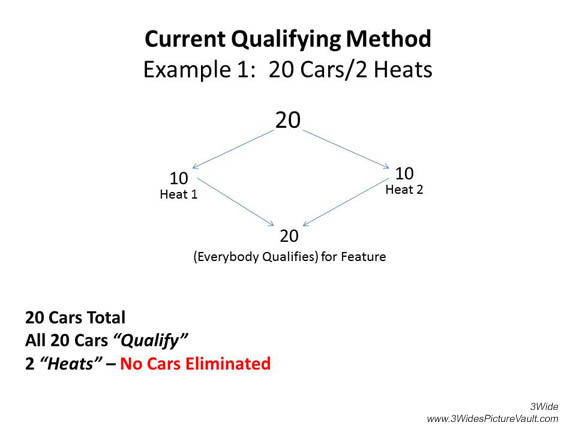 They have to accept that the heat/consolation and feature model must be changed in favor of a qualifying method that will improve today's show from beginning to end. We can continue to wait for the economy to improve... or wait for the trends that cause people to come and go in and out of the sport to become "favorable" once again. Or instead, we can stop blaming everyone and everything else for what in many cases is a show that is not compelling, and often offers only a few minutes of excitement and fun over the course of hours of events lacking excitement and competition. The qualifying method a track chooses is a big part of "the show" that those in charge can control. It is something that does not require facilities upgrade, new loads of clay, expensive construction, other large expenditures or higher purse payout. If someone is willing to take the chance, it is something that can be implemented right away. 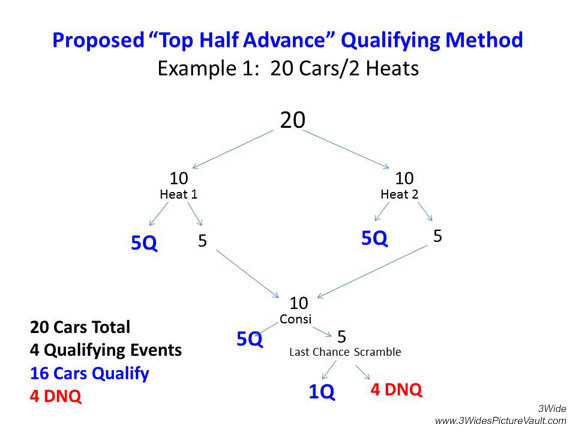 The "Top Half Advance” qualifying format is a logical approach because it draws the fan in from the beginning of the night and will keep them engaged right through the consolation events, and into the features. It will make for an exciting "complete" night at the races, which is something that is now missing from many tracks. "The winds of circumstance blow on us all, but we can all set our sail." 1 It's time to stop blaming everyone else for what's wrong with the sport. It's time for those who are in a position to "set the sail," and to understand the responsibility that comes with it, and to make the proper adjustments to guide short track racing in a different direction than it is currently heading. 1Quote from American Entrepreneur and Author Jim Rohn. YOU DECIDE - WHICH WOULD YOU RATHER WATCH? 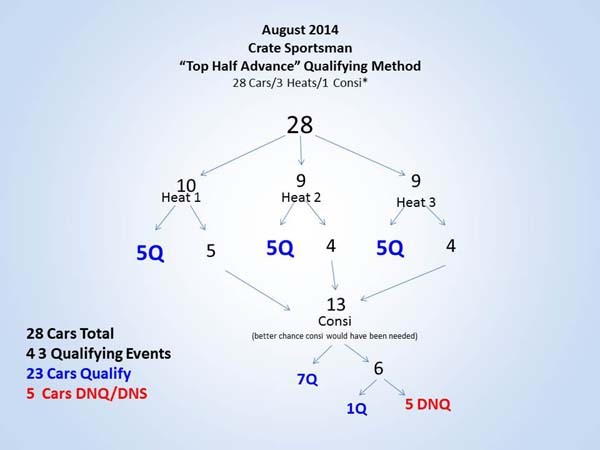 For those that don't like a lot of words, here's how the "Top Half Advance" Qualifying Method would work based on real current day (August 2014) car counts for a show consisting of Modifieds, Crate Sportsman and Outlaw Stocks. Compare the current method (left) that is being offered, to the proposed method (right) and ask yourself as a fan, which would you prefer to watch?